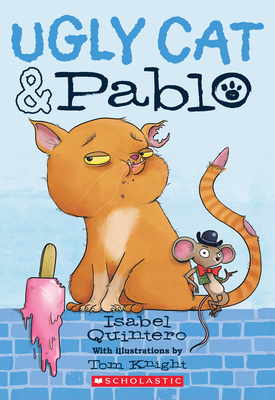 DESCRIPTION OF THE BOOK: Ugly Cat is dying for a paleta, or ice pop, and his friend Pablo is determined to help him get one by scaring a little girl who is enjoying a coconut paleta in the park. Things go horribly wrong when, instead of being scared, the little girl picks Pablo up and declares that he would make a great snack for her pet snake. Oh and there’s also the small problem that Ugly Cat may have inadvertently swallowed Pablo in all of the commotion! MY TWO CENTS: As Pablo likes to say “Oh my galleta!” What a charming, silly, delightful book! I was captivated by Ugly Cat and Pablo from the very first page. They are a fantastic odd couple, one pre-occupied with food and the other with adventure. Quintero’s dialogue is snappy and if some of the vocabulary is a little above the average elementary reader, it makes it a great read-aloud and vehicle for introducing new words in both English and Spanish. I appreciate that the Spanish isn’t italicized and all the characters go back and forth between both languages, so no one is singled out as the ‘Other’. Quintero slips in some good lessons about being kind to friends, listening, and using your words when there’s a misunderstanding. This book falls squarely in the genre of buddy animal comedy, with tons of kid appeal. The setting of an urban park is well chosen and readers will be almost as hungry as Ugly Cat by the time they finish reading the descriptions of all the great street food. Best of all, this is a series, so students who fall in love with Ugly Cat and Pablo will soon have more adventures to giggle over. Extra points to Scholastic for great book design and back matter! Ugly Cat and Pablo each have their own font for their dialogue, giving a comic book sensibility to the pages that don’t have any word bubbles as part of the illustrations. There are pictures on almost every page to lend support to visual learners, a glossary at the back that translates the Spanish, and even a recipe for Ugly Cat’s favorite treat, paletas. TEACHING TIPS: The strong characters and specific setting make this a great choice for elementary school book groups. Students can discuss the motivations each character, their misunderstandings and predictions for what will happen at all the cliff-hanger chapter endings. Students could also write their own endings for some of the book’s incidents and make different choices for the characters. Another great project would be to compare the friends in this book to other animal books with friends, such as classics Frog and Toad or George and Martha, or more contemporary stories such as The Story of Diva and Flea by Mo Willems. Students could also compare the parks and streets of Paris in Diva and Flea to the parks and streets in Ugly Cat and Pablo. ABOUT THE AUTHOR: Isabel Quintero is a writer and the daughter of Mexican immigrants. She was born, raised, and resides in the Inland Empire of Southern California. She earned her BA in English and her MA in English Composition at California State University, San Bernardino. Gabi, A Girl in Pieces from Cinco Puntos Press, her first novel, is the recipient of several awards including the 2015 William C. Morris Award for Debut YA Novel and the California Book Award Gold Medal for Young Adult. In addition, the book was included on School Library Journal’s Best Books of 2014, and one of Kirkus’ Best Teen Books of 2014, among other lists. 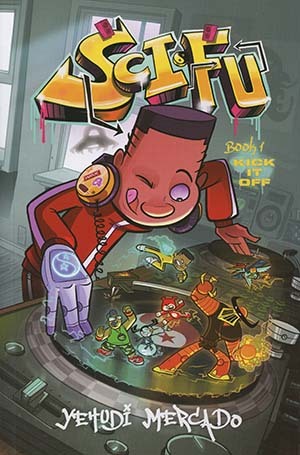 The first in her series of chapter books for Scholastic, Inc. Ugly Cat and Pablo, was released in Spring 2017. Her first graphic novel, a biography about photographer Graciela Iturbide, released by Getty Publications in March 2018. In addition to writing fiction, she also writes poetry and her work can be found in The Great American Literary Magazine, Huizache, As/Us Journal, The Acentos Review, The Pacific Review, and others. You can follow her on Twitter @isabelinpieces or visit her website laisabelquintero.com. DESCRIPTION FROM THE BOOK’S BACK COVER: Estefania “Stef” Soto is itching to shake off the onion-and-cilantro embrace of Tia Perla, her family’s taco truck. She wants nothing more than for Papi to get a normal job and for Tia Perla to be a distant memory. Then maybe everyone at school will stop seeing her as the Taco Queen. MY TWO CENTS: Jennifer Torres doesn’t waste any time introducing the readers to Stef and the people in her life, including Papi and her best friend Arthur in the first scene outside of their Catholic middle school. She notices Papi in his taco truck – known as Tia Perla for the rest of the book – and she gets angry because he had originally promised to let her meet him at a nearby gas station. This is the first of many conflicts Stef has with her parents about maturity at the seventh-grade level. The conflicts are about issues that come up in many houses of middle school students. One of my favorite scenes of the book is in chapter 3, when Stef reminisces about the early stages of Tia Perla being in her family’s life. From what Torres describes as “kitchen-table whispers” about the kinds of beans and salsa it’ll feature (“nothing from a jar,” insists Mami) to learning the origin of the name (Stef’s pick), the entire scene was sweet and a key part of the story. The chapters in the entire book are short but detailed enough for readers of any age to get a glimpse into Stef’s life. Despite the joy Tia Perla once brought to Stef, she feels anything but joy about the beloved truck as the book goes on. She tries to be nice to former-friend-turned-popular-girl Julia by offering her a ride home in Tia Perla, but Julia turns around and calls Stef the “Taco Queen” behind her back. This comes after Julia makes a scene before the start of their English class by announcing she has tickets to see local pop sensation Viviana Vega in concert. Torres then takes the readers into more of Stef’s life at Saint Scholastica School – trying to fit in and leave Tia Perla in the dust. Stef’s favorite day of the week is Tuesday, which she realizes is not common, because it’s when she has her art class. “And in art class,” Torres writes, “I never hear Mami’s voice telling me I’m too young, or Papi’s nagging me to be careful. I am in charge of the blank piece of paper in front of me, and I can turn it into something as vivid and adventurous or as quiet and calm as I want.” This part of the story stuck out to me because of the way Torres compares making art with wanting independence. Stef spends every Saturday helping her Papi and Tia Perla during their busiest day of the week. They travel to farmers markets, parks, and other outdoor common areas in their city to feed the crowds with the scrumptious food they’re known for. Even though Papi seems grateful every time Stef helps him out, she still wants nothing to do with Tia Perla, especially when it gets in the way of her independent life she’s trying to create. During a stop on one of Tia Perla’s routine Saturdays, Stef visits her other best friend, Amanda, after her soccer game. While the two are cooling off with the help of strawberry soda, they listen to the radio and eventually win concert tickets to see Viviana Vega. Stef is cautiously optimistic about her parents letting the two attend the concert alone – until they say no, despite her papi giving her a cell phone she thinks is to check in with them at the concert. The book then turns its focus to two more complex and meaningful issues previously introduced before Stef’s blowup with her papi. Stef and her classmates decide to work together in a unique way to get more art supplies (hint: a school-wide event is included). And, in a move that impacts Stef more than she realizes, Papi’s business (and Tia Perla) is threatened by new proposed city rules that would impact all food trucks in the area, specifically the taco trucks. Stef seems more mature than others her age when she mentions translating important notes for her papi and others from English into Spanish. The book ends with a couple of different twists that I didn’t see coming, but I believe both twists worked really well to help bring the story to a close. Stef learns to love all of the parts that make up her identity – even Tia Perla. Torres does a wonderful job describing the characters and each place they’re in throughout the book. I felt like I was following Stef and her family and friends through their adventures. The book addresses many important topics that may be tough for some kids and families to discuss, but I believe the issues were written in a way that kids can understand. I felt for Stef during some of the scenes with her parents. There are some basic Spanish words and sentences in the book, most of which are italicized except for one – Orale! That word appears several times in the book with several different meanings, which I loved. It helped set the tone for each of the different chapters, especially when Stef described each way it was written for each scene. Overall, Stef Soto, Taco Queen is a wonderful read. It’s recommended for kids in grades 4-7 (ages 9-12), but I would suggest it to anyone looking for a story about a girl trying to find herself in this crazy world. TEACHING TIPS: This book could be used to discuss the idea of working together to help solve problems, especially in the face of adversity. Stef’s art teacher, Mr. Salazar, helped his class raise money to bring in more art supplies, even though he was skeptical about their idea at first. The book could also be used in a way to discuss local politics for students. Not many middle-school students get involved with politics in such a way that Stef did, but I believe the book would be a good way to teach students how to make a difference in their community. ABOUT THE AUTHOR (from the book’s back cover): Jennifer Torres was 17-years-old–a senior at Alverno High School in Sierra Madre, California—when the first time a story of hers was published in a newspaper. The story was about making tamales with her family, but it was also about love and tradition and growing up. She went on to study journalism at Northwestern University and the University of Westminster. Today, she works as a freelance journalist and is the author Finding the Music, a picture book from Lee & Low. Jennifer lives with her husband and two little girls in central California. 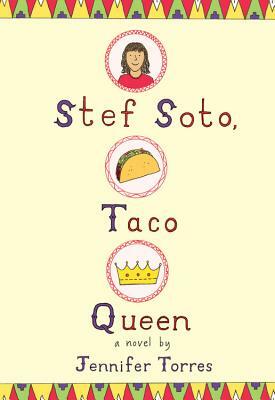 Stef Soto, Taco Queen is her debut novel. ABOUT THE REVIEWER: Caissa Casarez is a proud multiracial Latina and a self-proclaimed nerd. When she’s not working for public television, Caissa loves reading, tweeting, and drinking cold brew. She especially loves books and other stories by fellow marginalized voices. She wants to help reach out to kids once in her shoes through the love of books to let them know they’re not alone. Caissa lives in St. Paul, MN, with her partner and their rambunctious cat. Follow her on Twitter & Instagram at @cmcasarez. Roller Girl is a recipient of a 2016 Newbery Honor! FROM THE NEWBERY MEDAL HOME PAGE: Astrid falls in love with roller derby and learns how to be tougher, stronger and fearless. Jamieson perfectly captures the highs and lows of growing up in this dynamic graphic novel. MY TWO CENTS: Victoria Jamieson’s Roller Girl captivated me right off and only grew sweeter on a second reading. 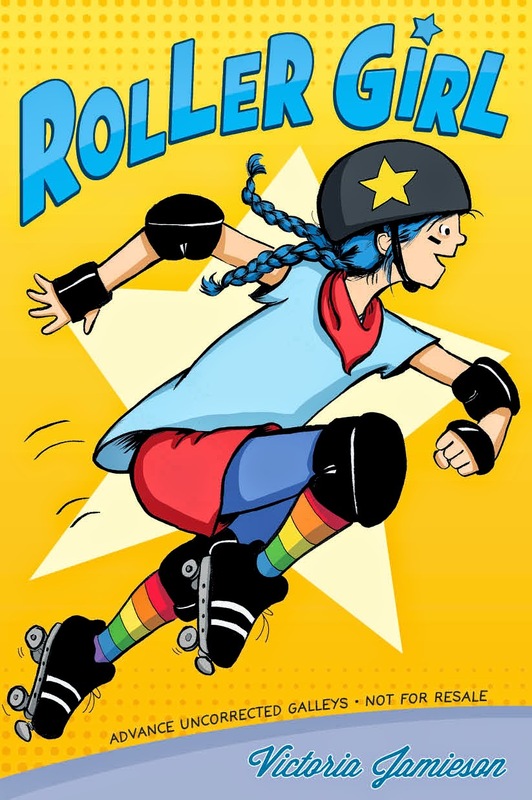 In addition to the immersive power of graphic novels, the story of Roller Girl delivers a solid punch: 12-year-old Astrid Vasquez gets hooked on roller derby and devotes herself to the sport while navigating the ups and downs of middle-school friendships. Astrid’s passion for roller derby ignites when Ms. Vasquez takes Astrid and her best friend, Nicole, to their first derby bout. Afterward, Astrid can talk of nothing but the derby and fails to notice that Nicole doesn’t share her excitement. Come on, how could she not? Check out the theater of it all: the players’ costumes and wild hair colors, the electricity of the crowd, and the take-no-prisoners energy that drives the sport. Astrid even discovers an idol in Rainbow Bite, a star jammer for the Rose City Rollers, who exemplifies roller derby’s ferocity and skill. Astrid loves the fact that there’s nothing girlie or restrained about roller-derby culture, and when she hears about summer camp for junior players, she’s chomping at the bit to sign up. Best friends do everything together, right? This assumption crumbles when Nicole reveals that she’s planning to attend dance camp instead, along with Rachel, Astrid’s one true nemesis from their early elementary days. With Nicole’s “desertion,” Astrid has to face the first day at derby camp alone. From there, complications abound. Ms. Vasquez is under the impression that Nicole’s mom will give Astrid a ride home at the end of each day’s session. Astrid is afraid to tell her mom that Nicole isn’t participating, as this would lead to all sorts of questions Astrid wants to avoid. As a result, the lies she must tell and the long walks home she must endure only add to the drama of those first grueling weeks at the rink. Did I mention that Astrid discovers she’s a lousy skater? None of these triumphs mean that Astrid transforms into a roller derby standout; what matters are the personal victories that she achieves over the course of the summer, including earning the respect of her teammates and figuring out some important things about who she is and what sort of friend she wants to be. Roller Girl succeeds on multiple levels. Through a lively narrative and a rich visual landscape, it draws readers into the fascinating world of roller derby, often explaining the rules and strategies of a sport unfamiliar to many through clever diagrams and dramatized scenes. Through these invitations to explore the sport, it portrays women and girls as highly capable both physically and intellectually. Readers get a clear sense that women can—and should—take on tough challenges. In addition, Roller Girl gives us a Latina character comfortable with her ethnic identity and shows us Anglo characters who are equally accepting. Astrid’s Latina background doesn’t even emerge until page 54, and only much later do we learn that the family is Puerto Rican. This information comes across casually, as just another cool detail about the main character. At least this is how Astrid’s new friend Zoey takes the information when Astrid reveals it during a scene in which West Side Story plays in the background. In general, my sense is that ethnicity may not be central to the story, yet it gives readers additional exposure to a positively framed diverse character who faces the same challenges most 12-year-olds face. In fact, one of the biggest ways that Roller Girl succeeds is in its depiction of Astrid’s emotional journey. It delivers an honest and satisfying ride through many of the complex social and internal upheavals of middle-school life. I particularly like the author’s portrayal of mixed emotions. On one page, a central panel depicts a kindergarten poster of cartoon faces bearing unambiguous expressions. The caption reads: “The feelings were all simple ones, like ‘happy’ and ‘sad.’ They didn’t tell you about feelings that got mixed together like a smoothie.” In the next panel, Astrid contemplates exactly such “mixed together” feelings, the result of running into Nicole after weeks of separation. Astrid is happy to see her former best friend yet sad about the emotional distance that stands between them now. Out of this, she coins a new word, “shad,” a distillation of those contradictory feelings—happy and sad. This moment of acceptance that emotions are complex seems to me a marker that a character is coming of age. As happens with the best of sports stories, Roller Girl follows a character’s trajectory through brutal training challenges, inevitable setbacks, as well as moments of triumph–and elevates these into something beyond athletic achievement. At twelve, Astrid is finding her way in the world. Some of her falls are literal and happen on the skating rink. Some are relational and emotional, and arrive without the benefit of coaches to teach her how to land injury-free. The important thing is that after each fall, Astrid is learning how to dust herself off and get back into the game. TEACHING TIPS AND RESOURCES: A major theme of Roller Girl is the troubled landscape of middle-school friendships. Try this exercise with young readers. Assign a “treasure hunt” for episodes in the story that demonstrate the ebb and flow of friendships. Ask students to identify relational missteps that Astrid and other characters make, i.e., jumping to conclusions, not listening, passing judgments, not speaking up; ask them to do a similar search for positive practices that build friendships. For visual help on grasping the rules of roller derby, check out the video on this page. One of Astrid’s challenges is figuring out a good derby name. There are rules and traditions that must be observed, as outlined in this guide. 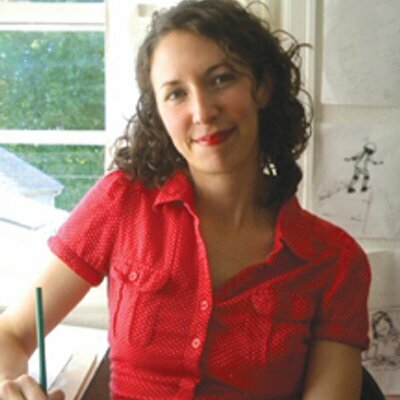 ABOUT THE AUTHOR/ILLUSTRATOR: Pennsylvania native Victoria Jamieson attended the Rhode Island School of Design. Her work history includes a stint as book designer for HarperCollins Children’s Books. She now writes, illustrates, and teaches illustration at Pacific Northwest College of Art in Portland, Oregon, where she also skates in the Rose City Rollers roller-derby league. Newbie skaters like Astrid could probably use the tips from this video.